I have been dabbling a bit and getting my feet wet with the "statement necklace" trend. I realize these types of necklaces have been prevalent for a while now, especially amongst the J. Crew set, so I'm a little late to the party. Recently I wanted to find a more neutral statement necklace to jazz up an outfit irrespective of the color palette. The J. Crew Crystal Droplets necklace was my solution to this. It's not too big or too bold and it's devoid of color, so just like water, it goes with everything. With so many options at hand, it was hard to choose what to wear it with first, but I decided to pair my new bauble with a new frock. The J. Crew scattered dot shift dress makes me feel a little bit like a Dalmatian, but I love its 60s inspired feel. This got me thinking: what is it about statement necklaces that women are so entranced by lately? As we speak, I'm watching the red carpet hoopla for the premiere of the new Great Gatsby movie. I guess wearing a big statement necklace gives a woman a touch of glamour and the red carpet effect of baubles and jewels for everyday and without the hefty price tag to match. 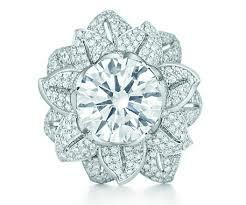 This reminds me that I recently visited Tiffany's website to check out their line of Great Gatsby inspired pieces. Some are quite reasonably priced and perhaps will make a debut in my jewel box soon, others are only affordable with a Gatsby sized bank account. Here are some baubles from Tiffany's that perhaps Tom would have bought Daisy in The Great Gatsby. 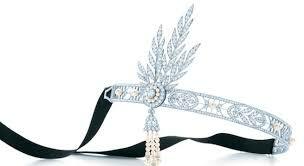 The first is a headdress that any flapper worth her salt would be giddy to wear. 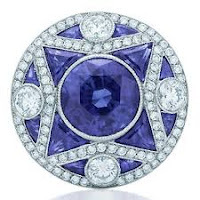 I find it interesting that it retails for $200,000 and that is the same price as the necklace that Tom buys for Daisy in the novel. If you think $200,000 is a lot today, imagine what that would have been in the 1920s. While you can't wear a diamond encrusted headdress just anywhere, you could opt for a cocktail ring, which is far more practical. 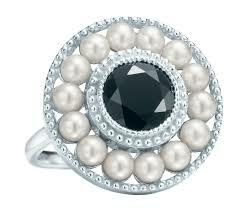 The following rings would be my personal choice from the Tiffany's Gatsby collection if money was no object. The diamond flower ring below is just shy of a cool million, retailing for $875,000 and the sapphire deco styled ring is a more affordable $55,000. Most likely I would opt for the following choice from Tiffany's Ziegfeld collection. It features onyx and pearls in a deco style motif and a price tag of $475 for the more budget conscious flappers out there. Actually, now that I think about it, this would compliment today's dress quite nicely! I couldn't agree more Faux ionista. I also think the statement necklace trend is going to wane soon. Although it's always fun to indulge in trends a little, I wouldn't blow too much money on it. I'll be saving up for my Tifanny's bling! Opps! I spelled Tiffany's incorrectly. I'm quite the bad speller, truth be told!